1.) Is there no shapes or arrows built-in like there is for Windows Paint? I guess if not, I have to draw them or find a .png of these shapes/arrows and import/resize? Seems kinda strange not to have this built-in functionality. 2.) How the heck do you install fonts? I downloaded "Bebas Neue" from dafont and dropped the Bebas Neue.otf file into: C > Windows > Fonts, and it shows up in Paint, but not in GIMP. I then removed it from that directory and double-clicked the file and hit "Install" and restarted GIMP, but It's still not showing up in GIMP either via search or manual scroll. I've tried to follow the GIMP user-manual which seems to be out-of-date. There's no "personal" folder in GIMP that I'm aware of, and there's no "fonts" folder in Edit > Preferences > Folders. Really, why is it so damn hard to get even the basics done with GIMP? I shouldn't have to spend a few hours figuring out how to install a font when it works instantly with POS Paint. 1) Gimp is an image editor, not a symboli drawing program. Drawing arrows is far from being its target. This said, plenty of arrow -drawing scripts and plugins around. But before this, go to Windows>Dockable dialogs>Fonts, click the ◀ in the top right, and then Fonts menu>Rescan fonts list. I don't know what version of GIMP you're using, but I'm using version 2.10.10 and when I go to Edit > Preferences > Folders, there's no "Fonts" folder there. There's only "Temporary folder" and "Swap folder". 1.) I was able to install the font, but opening the font and clicking "install" doesn't work. It works for MS Paint, but not GIMP. I noticed that the administrator icon was missing from the install button, so I had to right click the font > "install for all users", which doesn't make sense because I'm the only user on the computer. Install for all users does have the admin icon though. How do you have all of those folders under "folders" ?? 2.) So where are some good arrow / icon drawing scripts and plugins? (04-11-2019, 05:22 AM)Fennec Wrote: 1.) Is there no shapes or arrows built-in like there is for Windows Paint? You don't describe what you are actually doing. 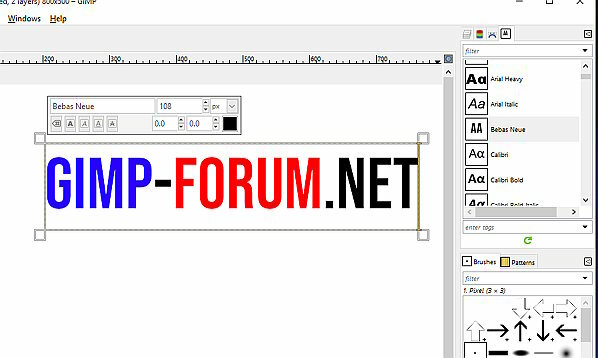 Gimp is a bitmap editor. Shapes and arrows are vectors. If you dong something like editing photographs and just adding an arrow, then Gimp is the right app. If you are doing mainly shapes and arrows then a vector app like Inkscape would be better. 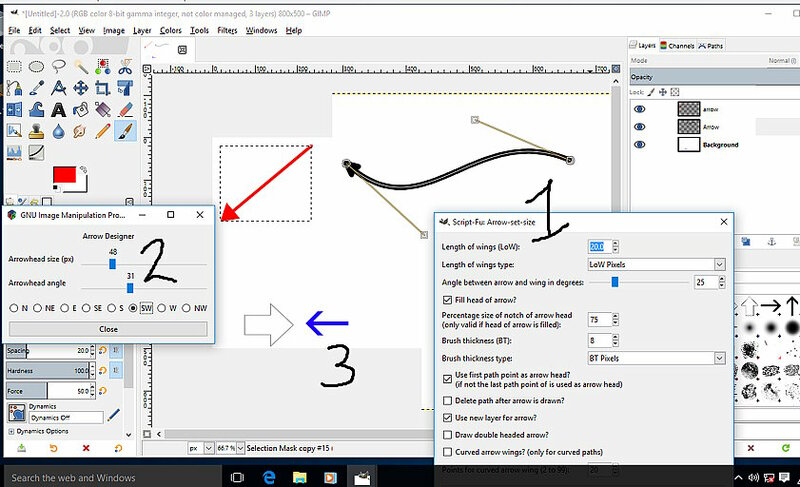 In Gimp, you can make your own arrow and then save it as 1) a brush or 2) a path. There are a whole bunch of personal folders, called your User Profile. The Folders that Ofnuts referenced point to these. There is a Fonts folder here. You can put your font in there. Refresh fonts or restart Gimp. I can see the fonts folder. So I drop the font inside the folder? I did that but I don't see the "fonts" folder show up in GIMP under preferences > folders. So do I need to link this somehow? I also tried these steps from ofnuts: "Windows>Dockable dialogs>Fonts, click the ◀ in the top right, and then Fonts menu>Rescan fonts list." (04-11-2019, 06:47 AM)Fennec Wrote: I don't know what version of GIMP you're using, but I'm using version 2.10.10 and when I go to Edit > Preferences > Folders, there's no "Fonts" folder there. There's only "Temporary folder" and "Swap folder". Also on 2.10.10. If you haven't noticed, there is a + icon on the left of Folders which is the rather ubiquitous indication that if you click on it, your will unfold something. On my picture above, it is unfolded, so the + is replaced by a -. You are not going to get far with Gimp if you are expecting some sort of click-n-wish-dumbed-down application. I cannot think of any advanced graphics editor that does not have a learning curve. Gimp has a steep learning curve. Ways to make arrows in Gimp (apart from just drawing them in) As Blighty wrote, ways include brushes or using a script or plugin. This an all-in-one screenshot. A script: arrow-set-size.scm that uses a path to define the shape. A plugin arrowdesigner-0.5.py that uses a bounding selection and current brush/colour. Brushes (dozens if you search) a black outline and a grayscale that takes the FG colour. Use brushes like a stamp, the snag, if scaled up they become fuzzy, same as any raster graphic. brushes go in C:\Users\"yourname"\AppData\Roaming\GIMP\2.10\brushes - find in the brushes dock. Quote: ..I don't know what version of GIMP you're using, but I'm using version 2.10.10 and when I go to Edit > Preferences > Folders, there's no "Fonts" folder there. There's only "Temporary folder" and "Swap folder"
Expanding on Ofnuts screenshot, You do not have anything like this? 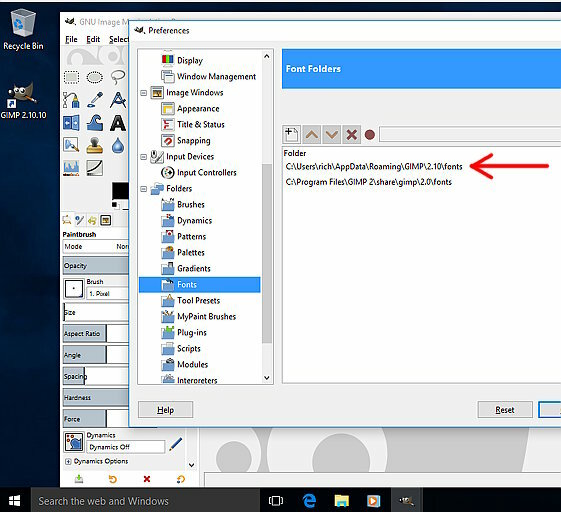 That shows where to install resources. If not there, then your Gimp installation is screwed up. First step is delete C:\Users\"yourname"\AppData\Roaming\GIMP Start Gimp and let it create a new default Gimp profile. Check for the folders again. It might help if you give the Windows version: Win 7 / 10 and 32 bit / 64 bit. Windows 10 - 64 Bit. Yeah, I reinstalled GIMP and It's fine now. I can see 2 "Font Folders" options when I click on "Fonts" under "Preferences"
You mentioned that option a.) is better to store fonts than option b. ), why's that? 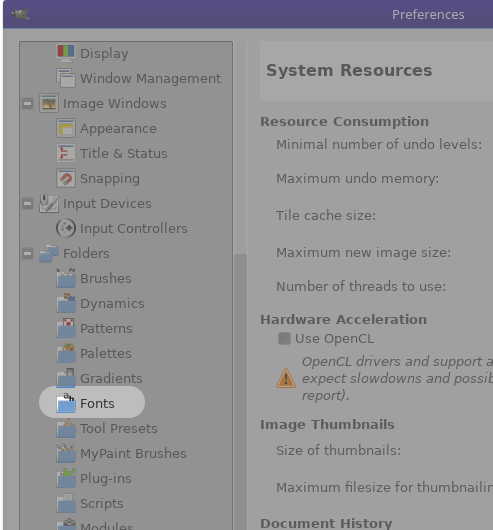 (04-19-2019, 03:21 AM)Fennec Wrote: I can see 2 "Font Folders" options when I click on "Fonts" under "Preferences"
things in b) are visible to all users (think "family computer") and other users may no care for your collection of heroic fantasy fonts which for them is just clutter in the fonts list. Hey Fennec, I so get your frustration. I've dabbled with GIMP off and on almost since its inception, but only switched from Photoshop a few months ago when my ancient version of Photoshop failed to load on a new computer. I started with the Corel Suite at least twenty years ago, mastered that, then spent agonizing weeks switching to Photoshop. This switch to GIMP has been equally frustrating. It's both a blessing and a curse to know what should be possible and not find the way to do it. I'm here to assure you that it IS possible, but it WILL take time. If you want quick and dirty and elegantly simple app for cropping, resizing, and adding text, simple arrows and such, check out IrfanView. It's another free app for the Windows platform that's my default image viewer and quick resizer tool. With its extensive collection of free plug-ins, it's got an amazing array of tools and flexibility, though it lacks the degree of control and high-end results you get with GIMP. GIMP is a bitmap based app, but its vector-based path tool is equivalent to or better than any other raster program I've used, and I've tried quite a list. Take a deep breath, stay calm, and notice how respectful and supportive the folks on this forum are. In the beginning, a few hours with YouTube will also be a good investment of time.